"How strange to have a cultivated woman in the house again�and how intoxicating. Indeed, to have all three of my sons under my roof again, fills me with such a deep, quiet satisfaction, that I thank God." Legends of the Fall is much like a throwback to an extravagant western film and a sappy romantic novel rolled into one. Adapted from the Jim Harrison novella, the film feels like little more than an excuse to once again bring a sweeping olden day epic to the silver screen�and I find nothing wrong with that. While often overly lush and melodramatic, Legends is an entertaining yarn filled with gorgeous landscapes and engaging characters. The success of this moving period piece is proof that there is still a place in Hollywood today for tales of luxuriant adventure and romance. The film begins with a quick back-story introducing us to Colonel William Ludlow (Anthony Hopkins), who has moved himself and his three sons to the remote wilderness after becoming disturbed with the way the U.S. Army treats its Native Americans. Over the years, Colonel Ludlow teaches his sons the basics of survival and how to work the farm. Through this quick montage, we watch the three sons grow to manhood, each of them developing their own distinct traits of courage, sensibility, and purity. The story then moves forward more than 10 years, when the youngest son, Samuel (Henry Thomas), returns home from college with his fiancée, Susannah (Julia Ormond). 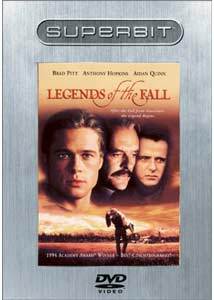 The two join Colonel Ludlow and the other two brothers, wild-hearted Tristan (Brad Pitt) and rational-minded Alfred (Aidan Quinn), on the farm. Though Samuel pledges his undying love to Susannah, he also pledges to serve his country by traveling off to war. Much to their father's dismay, the three brothers depart from home to fight in World War I, leaving him and Susannah praying for their safe return. It is after this fall from innocence that the legend begins, with the Ludlow family permanently affected by the war and Susannah eventually touching the lives of all three brothers. The vast story takes us through the beautiful countryside of the old west, the trenches of World War I, and the delicate sands of New Guinea, each stunning location proving to be a cinematographer's dream. Veteran DP John Toll has constructed a magnificent visual palette out of these vistas, each shot appearing like a beautiful painting. From the widespread rolling hills of the wilderness to the dim and smoky battlefield to the sepia-toned interiors of the countryside homes, every shot breathes a life all its own. These powerful compositions earned Toll a well-deserved Oscar�. Richly complementing these visuals is James Horner's moving musical score. Though I often find Horner to be somewhat derivative, this is one of his better works, adding significant emotional grandeur to the expansive story line. Of course, a film cannot be judged simply on music and cinematography alone. While the visuals are stimulating, perhaps more engrossing are the engaging performances. In a breakthrough role, Brad Pitt proves himself to be a fully capable actor, paving the way for his excellent turn in Se7en and his Oscar�-nominated performance in 12 Monkeys. Even more impressive than Pitt's star power is the acting prowess of Aidan Quinn and Sir Anthony Hopkins, both of whom exude a passion and skill for their craft that allows them to seamlessly sink into their roles. Henry Thomas and Julia Ormond also hold their own against these major players, adding charm and innocence through their subtle performances. At the helm is director Edward Zwick, an inspired directorial choice who is familiar with this type of subject matter and knows how to handle it well. While he has done an excellent job with this material, I expected more from his talents, especially considering Legends came shortly after his Civil War masterpiece, Glory. While Zwick demonstrates a keen sense for intertwining the action, drama, and romance, the result is not nearly as polished as one might expect from such a talented filmmaker. Many of the scenes lack emotion and often feel hurried in order to reach the next story arc. The war sequences are grand, but somewhat passionless and pale in comparison to the magnificent battles found in Glory. Legends of the Fall is both a deeply entertaining and a deeply flawed film. Covering many events over a large span of time, the film simultaneously feels too long and too short. However, while no one particular event of the story is utterly fantastic, the sum of the parts is pleasing and the progression of the characters is interesting to watch unfold. Frequently melodramatic, over-the-top, and larger than life, Legends of the Fall is everything I would expect from a sweeping, romantic adventure film. Image Transfer Review: The anamorphic widescreen image transfer is quite pleasing, but far from living up to the acclaimed Superbit status. In comparing the transfer to the previous special edition, there does seem to be slightly better clarity and detail, but nothing that leaps off the screen. Overall, the image is very similar to the previous release, boasting excellent blacks and an impressive three-dimensional aesthetic. Color demonstrates minor improvement, and while hues are nicely textured, saturation is somewhat dull. The most disappointing element of this transfer is the abundance of film artifacts. Though these are source-related, I would think that some effort would have gone in to minimizing their presence. While these nicks, scrapes, and blemishes do not typically bother me, I found the level of film artifacts to be downright distracting. Sporadic edge enhancement also hampers what could have been a more film-like presentation. This is an above average image transfer, but nothing that justifies a separate Superbit release. Audio Transfer Review: Keeping up with Superbit standards, both Dolby Digital 5.1 and DTS soundtracks are offered. While the DTS track seems to possess a tad more depth, both tracks are virtually identical in both their strengths and weaknesses. Though predominately a quiescent movie, the surrounds remain constantly engaged, often enveloping the viewer with ambient effects. When dynamic intensity reaches its peak range during the battle scenes, the soundfield is fully aggressive, assaulting the listener from all directions. While the bottom end from the explosions is powerful, I found its presence to sound much too boomy and lacking in depth. James Horner's score is wonderfully expansive and fills the room with sweeping crescendos, though I also found the low end of his score to sound somewhat loose. Both 5.1 soundtracks are excellent, but not quite worthy of the Superbit treatment. Extras Review: A standard Superbit release, Legends of the Fall contains none of the interesting special features found on the previous special edition. The only inclusion is the traditional abundance of subtitle options. Whatever happened to Superbit Deluxe? While Legends of the Fall is recommended, I see no reason to choose this Superbit version over the previous special edition. The image transfer is merely a marginal improvement and the absence of special features is a disappointment. The only reason I can find to purchase this Superbit release would be if you absolutely must have a DTS soundtrack.